Regular readers of this blog (ha!!) will recall that while in London last year I created an espresso cup embossed with a map of the lunar surface. I had originally attempted to send the cup to Shapeways for printing, but was told that the fine details would be completely lost because of the nature of their ceramic printing process. So with the help of my friends at the Institute of Making, we 3D printed the cup in plastic, created a plaster mould of that object, and then cast ceramic from the mould. That was then. 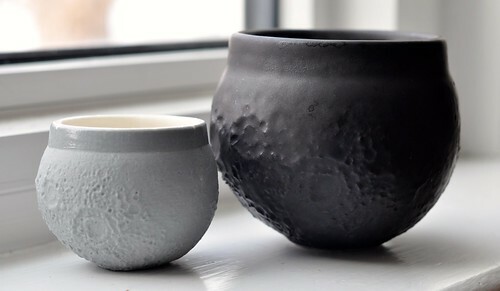 Shapeways has since parted ways with their original ceramic manufacturer, and they’re currently piloting their own in-house porcelain process. I’ve since come to learn that the process is based on converting an uploaded 3D model into a mould, which is then printed in plaster and used to cast the porcelain! This process is much closer to the one I followed, and it stands to reason that it will be able to print a wider range of wild objects (since it’s easier to 3D print a self-supporting mould than the object itself, and maybe easier to preserve fine details too). I was interested, then, to see how this process would fare with the moon shot cup, and ordered one in matte black, the only non-glossy finish available with porcelain. The cup arrived about a week ago. 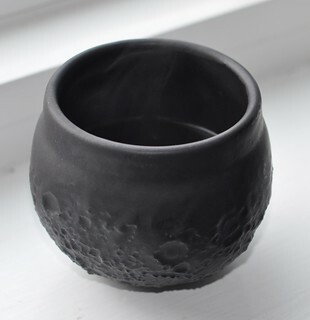 The 3D printed moon shot espresso cup in matte black. The result are pretty good! The cup is recognizably moonish, and the finish works well for this object. I’m left wishing for a matte grey finish instead of matte black, but I doubt that will ever be an option at Shapeways—I just can’t see it ever being a popular finish for most porcelain objects. The other obvious difference is the size. The direct 3D printed cup is much bigger than the hand cast one. A side-by-side comparison of the original cast moon shot cup with the fully 3D printed one. The size difference is obvious. The small cup preserves more details as well. It’s natural to assume that these are created from differently scaled versions of the same 3D model, but that’s not necessarily true. The hand cast cup shrinks a lot relative to the original 3D printed positive—that’s just the nature of ceramics. On the other hand, it wouldn’t surprise me if Shapeways scaled up models before printing their porcelain mould, to compensate for this very effect. If that’s not well calibrated, objects can end up larger than expected. And yes, it’s possible that I scaled the model up after my first experience and forgot about it. I should compare with the positive I used for casting, which I still have lying around. In any case, this new cup holds about 160 mL (about 5.4 fluid ounces). That’s a weird size: too big for a double espresso, and too small for a decent cup of drip coffee. It’s quite possible I’ll want to scale the model again once porcelain becomes available to everyone. In the end I think the fully 3D printed cup is satisfactory but not as fine as the hand cast one. 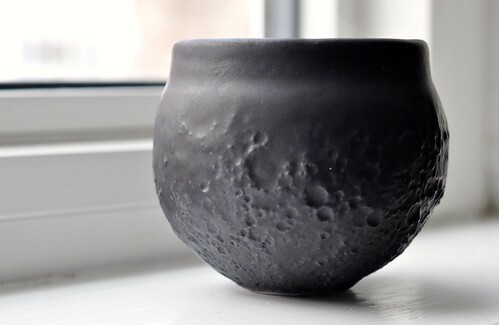 But given that there are only about a dozen hand cast cups and not much prospect for more, perhaps moon enthusiasts will be happy to get their coffee fix from this new version. And no, I don’t expect Shapeways will ever introduce an option to include powdered moon rock in the clay. That will remain the special hidden feature of the original cups. I have one more porcelain object headed my way as I write this: a new print of the Little Dipper. That should print without any problem, and I think it might get some sales on Shapeways once porcelain becomes available. On the other hand, I was told that the Horned Mug I mentioned previously can’t be printed after all, because they’re unable to eject all the loose powder from the crazily shaped mould I’m asking them to create. I’m not sure how I might redesign the model to compensate, so this might just have to go on the back burner for the next generation of 3D printed porcelain. One Response to "Moon shot espresso cup, Mark II"